In Depression Quest, a choose-your-adventure style game, you assume the role of someone living with depression. Just like any interactive fiction game, you make choices to advance the story, but there’s one catch: to tangibly convey the emotional experience of depression, the game shows you the entire range of possible actions, but some of those options are crossed out depending on your current happiness level. The frustration a player experiences in playing Depression Quest can tell them a lot more than a simple medical description of depression. “Dystopian document thriller” Papers, Please is a game in which you play as an immigration inspector at the border checkpoint of fictional country Arstotzka. While the gameplay is relatively basic (reviewing and stamping papers), the game effectively portrays a volatile political situation and evokes a sense of emotional toll within the player. All these affordances seem to suggest that the video game medium has the opportunity to enable new modes of journalism. 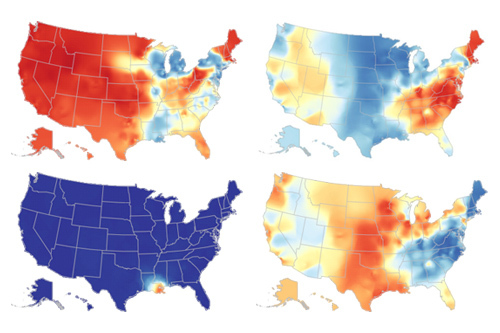 Newsrooms haven’t missed out on this — the most-trafficked New York Times story of last year was How Y’all, Youse and You Guys Talk, a quiz (based on real research) that asks you about what words and pronunciations you use for different things in order to identify your dialect. Mother Jones has open sourced a library that turns Google Spreadsheets into simple news quiz games. Nobody’s Facebook feed is free from the reach of the BuzzFeed quiz, a format that they continue to iterate upon. In some ways, the newsgame seems to be the natural extension of the interactive graphic. They can be used to distill complex concepts, like BusinessWeek’s bitcoin mining minigame, what I like to think of as a game version of the explainer. Moreover, newsgames can be used to viscerally communicate real-world data, as can be seen in ProPublica’s HeartSaver, a game in which you must rush the heart attack victims of New York to nearby hospitals. Now we’re starting to get into the territory of conveying emotional experience. Similarly, The New York Times’ Gauging Your Distraction puts you behind the wheel of a car, in which you must juggle the tasks of switching lanes and texting. While I’m still in the exploratory phase of my project, my general idea is to create some sort of newsgame design tool or toolkit to help newsrooms create games for journalism, with the hope of eliminating some of the technical hurdles that have prevented all but the most code-savvy newsrooms from dabbling in the field. My major concern with developing it as a tool is the balancing act between procedural generation/abstraction and the hand-crafted design elements that are so core to an effective game experience. Highly procedural approaches like The Cartoonist are great in terms of lowering the technical barriers to entry for newsrooms, but the resulting games (at least the ones I have been able to read about or watch online) seem pretty reductive, as the engine generates games based on user-defined relationships and verbs. Another approach would be to anticipate a few key narrative frames and having those directly translate into corresponding gameplay elements. With any of these approaches, repetitiveness between the resulting games seems to be a major problem — even if the theming/artwork has been changed, players will easily recognize that they are playing the same game. With these concerns in mind, it seems like I will focus on a more generalized tool — perhaps repurposing an existing engine like Twine specifically for the newsroom, or creating tools for playful interactive experiences (but not full “games” per se) like quizzes. The project might even take the form of a design toolkit to help newsrooms through the process of conceptualizing a newsgame. I will be talking to the MIT Game Lab and other game developers to further define the scope of the project; it will also be important to get feedback from newsrooms looking to develop games and what sorts of stories they see coming out of this. Finally, I welcome any suggestions and feedback from all of you in terms of where to take this project. With shrinking newsrooms, shrinking newsroom budgets and desperate news organizations trying to remain relevant and profitable, journalists are being put under nearly impossible demands. The Oregonian has recently insisted its staffers post three articles a day, several comments on the site AND produce two major projects a quarter. Reporters under these types of production pressures need to remove as much friction from the reporting process as possible. What I propose is developing a prototype for a usable and trustworthy expert database that journalists can turn to quickly to find relevant scholarly articles, op-eds and university professors with real expertise on a given topic. This site would need to trawl google scholar, giving heavy weight to the most cited articles, as well as google news and universities’ own web sites to quickly give reporters the information they need and contact details and bios for the top experts in the field. Let’s say there is a train crash and a reporter is assigned to look at the safety of the U.S. rail system. Often, within minutes after such an event, a newsroom is bombarded with emails from university flaks trying to push their ”experts” into the news stories. Overworked reporters are very likely to bite, meaning the experts with the most aggressive PR machines, rather than those with the most relevance to the topic, will end up being cited. With my proposed tool, journalists could easily access the most relevant people to interview. They would type ”rail safety” in a search bar and the resource would respond with a list of experts. Under each expert, possibly ranked by google scholar citations as a signifier of relevance, would be a bio culled from their university website, contact details and links to their main research in the field as well as op-eds they might have written on the topic. There currently is a quite poor resource called Profnet that is run by PRNewswire and is essentially a public relations exercise on behalf of universities seeking to get as much press attention as possible. Again, the spoils go to the most aggressive PR machine, not the most relevant expert. This new tool would be more trustworthy and thus more useful to getting the best information to the journalist, and by extension to the public, in as smooth a manner as possible. To try to make this a reality, I’d need to partner with an experienced coder who could help me get a prototype off the ground. The goal of this SchoolsMap project is to pilot a central portal for education information, using both data and video tools. As we have discussed in previous posts, health journalism isn’t always as diverse and accurate as it could be. While measuring quality in journalism is a difficult task, Ali and I wanted to create a tool that could allow journalists to see where there may be space for improvement or missed opportunities in their health coverage. So we propose a tool that would allow journalists to compare the proportion of coverage at the top 25 media outlets in the world on a given health subject to 1) the proportion of related research spending in a given year 2) and the relative health impact of that subject on the population. Then the website we build will spit out a visualization (probably a bubble chart) of how much coverage the disease garnered at that media source compared to how much money was invested in diabetes-related research globally and how much that health issue impacts quality of life compared to other factors. We could also rate the robustness of a news outlet’s coverage (ie, We could give a poor grade to a source that is severely under-covering an important health issue or subject for which there is a lot of research output). Ali has access to a database of media stories from the world’s top 25 outlets and we will do key word searches in each source to find out how often the top disease burden factors are mentioned. To measure health impact, we are using global data from the Institute of Health Metrics and Evaluation (IHME) about the relative impact on DALYs or disability-adjusted life years. This “is a measure of overall disease burden, expressed as the number of years lost due to ill-health, disability or early death” which gives a sense of which diseases or exposures lead to the most deaths” and DALYs include everything from obesity to cancer and pollution. For the data on health-research investment, we are using global data from IHME, as well. The data will be visualized in bubbles that allow users to easily see where there are gaps between coverage, research spending, and public-health impact. The user will get a sense of whether the health coverage at a given paper is actually representing related research and disease burden. We hope that journalists and editors who cover health could use this tool to find missed opportunities and ideas for how to expand their work.